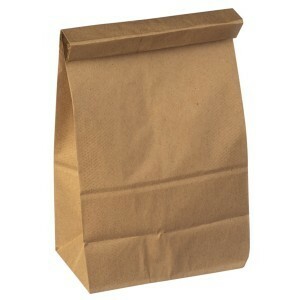 A titular "sack" used for "sack lunches." They're both in the same Lake Pend Oreille school district, but Sandpoint High School and Clark Fork Junior/Senior High School have some pretty major differences. Sandpoint High's in the comparatively urban tourist town of Sandpoint, while Clark Fork's about 30 miles away, in a much more rural area. Sandpoint High has 967 students enrolled. Clark Fork only has 88. And Sandpoint still serves hot lunch. At Clark Fork, hot lunches are no longer an option. Yesterday, KREM reported on the frustrated Clark Fork community members — unsatisfied with the quality of the lunches (complaints range from stale bread to sour milk) — who have banded together to serve homemade hot lunch to students anyway. The idea of getting rid of hot lunches to save money seemed an unusual one, so I called up Shawn Woodward of the Lake Pend Oreille School District to find out the story. He says the district's big dilemma was one of volume and reimbursement rates. Since there were only around 20 kids eating lunch, the hot lunch reimbursement from the federal government didn't even come close to covering the cost. And that cost was significant, about $56,000 a year for the district, Woodward says. Assuming 20 kids eating lunch on average, and 180 school days, and it'd be a lot cheaper for the students to eat out (say, get the "Moose Breath" Burger at the nearby Cabinet Mountain Bar & Grill) every single day. So the district had a choice: Eat that cost every year for the two dozen or so students who eat lunch. Or find an alternative. "What we ended up wanting to do is make sure no kid out there went without a meal," Woodward says. By switching from hot lunch to cold lunch they're now able to offer every student "free" lunch, and still save the district about $30,000 — almost as much as an Idaho first-year teacher salary. The district is looking at cutting about $1 million from the budget this spring, and every little bit helps. Even if the levy passes on March 10, that budget deficit will remain. Sandpoint provides a strong property tax base compared to much of Idaho, but so far hasn't taken advantage of that. "Our levy rate is about 50 percent lower than the state average in Idaho," Woodward says. "If you push the envelope too hard you start losing voters. They expect us to make hard decisions." But food quality remains a concern. On some days later in the week, the lunches are refrigerated overnight, and delivered one or two days later. As a veteran peanut butter-and-jelly sandwich connoisseur, I know how awful a PB&J can be, even tightly sealed in Tupperware, after enough time has passed. Stale bread is awful. Bread with the jam soaked into it is gag-worthy. Woodward does, however, say that the district's nutrition specialist surveyed the students, and didn't find any complaining about spoiled milk or past-their-expiration date food. The district has changed its menu based on student feedback, and initially, Woodward says, more students were taking the cold lunches than were taking the hot lunches before. That number has decreased a bit recently he says, which isn't a great sign for the tastiness of the sack lunches. Though, as I know well from the dreaded "Cheese Zombies" once served at Linwood Elementary, the grossness of school lunch, hot or cold, is a time-honored American tradition. Woodward says he knows some in Clark Fork "feel like they’re getting a short end of the stick living out in a rural setting." But there are advantages to living out there as well, he says. The school has 19 class sections with fewer than 10 students. Fourteen of them have fewer than five. That means teachers have that much more time to individually help their students. It's one reason why, despite their limitations and lack of lunch choices, small schools often do better academically than large ones.